Lennon (1860) stated he had bred twenty on, presumably from larvae he had collected from around Dumfries whilst out rambling. By 1863, he further stated that it was not common, but that he had found it at Tinwald Downs and Dalskairth. R. S. Gordon (1913) had found the larvae common on all the moors around Corsemalzie, Wigtownshire. The imago rarely being seen, and then only at rest on heather. A large number of larvae were collected in May, 1898. This species is additional to MOGBI for VC74. One record from the Caerlaverock Rothamsted station in 1975, is the only RIS data. Pelham-Clinton also found it at Stenhouse Wood SWT, Tynron in 1982, while in 1997 it was trapped on Bell's Flow. These were all the records for Dumfriesshire since Lennon's. 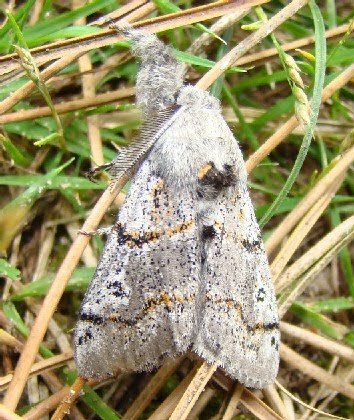 Kirkcudbrightshire fared no better, being recorded at just eight sites during 1996-2010, and Wigtownshire mustered records from seven sites in the same period, proving that it is a scarce moth indeed. One was trapped in Dumfries, not far from Craigs Moss, on 17 June 2017. One generation. Overwinters as a small larva during late August to May, apparently hibernating for two winters. Heather, but larvae also known to feed on other woody plants. With the characteristic resting posture of the hairy front legs stretched forward and orange blotches on the forewing it is readily identifiable. Found most often on upland heaths, moorlands and bogs, but also occurs in other habitats with Heather, especially on the coast.